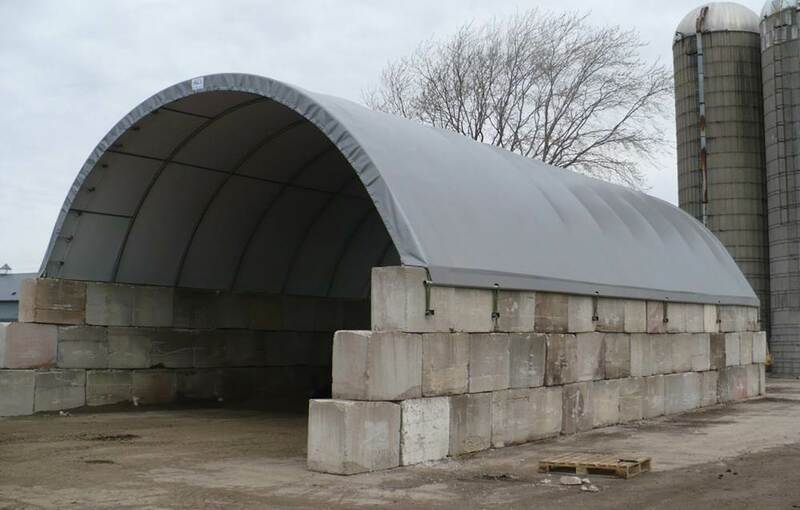 Hoop buildings mounted on concrete blocks provide landscapers, municipalities, farmers, and various business owners with cost efficient alternative for storing bulk material such as sand, salt, mulch, lumber by products, compost, and animal waste. The concrete blocks have a variety of terms including bin blocks, mafia blocks, bunker blocks, and ecology blocks. Regardless of the terminology, these blocks provide for foundational support, rigidity, and increased internal clearance for the interior of the hoop building. Hoop buildings can be mounted to these blocks due to the simplistic design of the framework. Flat based steel plates are fastened to the bottom of each leg which can be secured to the bin and bunker blocks. The weight of the ecology mafia blocks provide a solid foundation to prevent building uplift. Most manufacturers offer white covers which typically provide for natural interior lighting and visibility to reduce the need for electricity. Bunker block buildings are offered in a variety of sizes to accommodate most applications. Contact us today for a custom quote on your concrete block building.